LAS VEGAS -- The newly crowned Miss USA is a 26-year-old Army officer from the District of Columbia who at one point lived in Fayetteville. She gave perhaps the strongest answer of the night when asked about women in combat. "As a woman in the United States Army, I think ... we are just as tough as men. As a commander of my unit, I'm powerful, I am dedicated," Deshauna Barber said. "Gender does not limit us in the United States." As the winner of Sunday's 2016 Miss USA competition held at the T-Mobile Arena off the Las Vegas Strip, Barber will go on to compete in the Miss Universe contest. Coming in second was Miss Hawaii, who punted during the question-and-answer segment when asked who she would vote for among the likely presidential candidates, Democrat Hillary Clinton or former pageant owner Donald Trump, a Republican. Chelsea Hardin acknowledged that there was no way to correctly answer the question during the beauty pageant. The question was framed with Clinton's likely status of being the first woman nominated by a major political party for the White House. Hardin responded that gender doesn't matter when deciding the next commander in chief. The 24-year-old college student from Honolulu simply said the new president should push for what's right for the country. The other women in the top five were asked about voting rights, income inequality and the recent death of sports icon Muhammad Ali. Fan favorite Miss California, Nadia Grace Mejia, had stumbled and paused when answering a question about social and economic inequality. The 20-year-old model, who is the daughter of the 1990s one-hit-wonder singer known as "Rico Suave," had also talked about suffering from anorexia and wanting to promote body confidence earlier in the show. The Fox network carried the three-hour broadcast. Last year, the show aired on cable's Reelz network. The beauty pageant organization is bouncing back from a series of controversies last year, including a breakup with former owner Donald Trump and the mistaken crowning of Miss Universe. At the start of Sunday's show, Steve Harvey made a cameo in a video to poke fun of the Miss Universe crowning that he botched in December. Harvey was hosting that event, also held in Las Vegas, and had mistakenly named Colombia's Ariadna Gutierrez Arevalo the winner before correcting himself on the stage. Pia Alonzo Wurtzbach of the Philippines was then given the crown. Officials later said it was due to human error. The talk show host said he had re-read the card and noticed it said "first runner-up" next to the Colombia contestant's name before clarifying with producers his mistake. As for Trump - who didn't appear at Sunday's Miss USA pageant - the presumptive Republican presidential nominee wasn't forgotten by viewers on social media. Perhaps as polarizing as his policy views were the reactions to the Miss USA show on Twitter. Some commented that the event was less campy and more boring than previous years without the brash billionaire's involvement, while others said they were glad to take in the guilty-pleasure show without supporting the businessman turned politician. A year ago, Trump set off an ugly break up with The Miss Universe Organization, then co-owned by Trump and NBCUniversal. Trump offended Hispanics last June when he made anti-immigrant remarks in announcing his bid for the White House. NBC, which had aired the pageant since 2003, quickly cut business ties with Trump and refused to carry the 2015 show it had already scheduled. The Spanish-language network Univision also pulled out of the broadcast for what would have been the first of five years airing the pageants. Trump then sued both Univision and NBC. He settled with NBC in September. Trump's $500 million lawsuit against Univision claimed his First Amendment rights were violated, as well as claiming a breach of contract. That dispute was eventually settled, too. 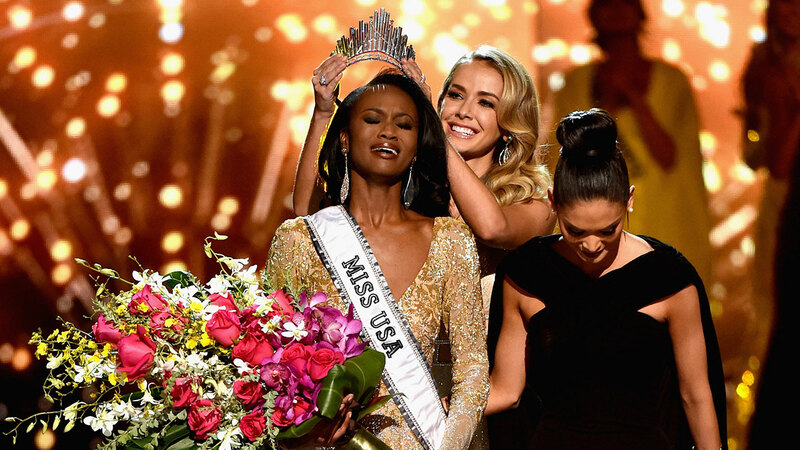 The talent management company WME/IMG then acquired The Miss Universe Organization.